I’m pleased to offer a 25% advance order discount on Five Rivers two new upcoming books, How to Write a Non-fiction Book in 60 Days, and Elephant’s Breath & London Smoke: Historical Colour Names, Definitions & Uses, by Deb Salisbury. If ordering as a Christmas present, just send a note in the Comments section of Five Rivers secure shopping cart, and I’ll be sure to send along a note to the email address you provide detailing the purchase and when it’s expected to arrive. 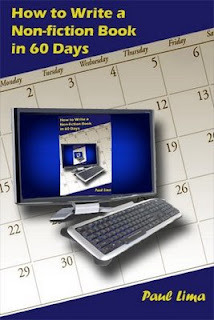 The title says it all, written by none other than the very successful six-figure freelancer, Paul Lima. The book will show you how to create a detailed, chapter-by-chapter outline and how to write each chapter from point to point. In addition, the book includes two bonus chapters: one on self-publishing and one on constructing effective sentences and paragraphs. How to Write a Non-fiction Book in 60 Days will be available through online booksellers internationally, as well as select bookstores in Ontario. Paul will also be doing a series of talks and book signings through select Chapters locations in Ontario. I’ve known Deb Salisbury for nearly a decade; she’s a remarkable historical garment pattern maker, who, through her extensive research, has compiled a considerable body of information. 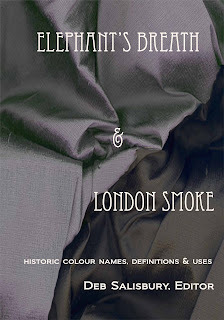 Elephant’s Breath & London Smoke is an indispensable tool for the historical garment maven and researcher, covering colour names, definitions and uses through primary sources from Elizabethan through Edwardian Eras, and will be the first of three books on historical garment terms, fabrications and fashion.